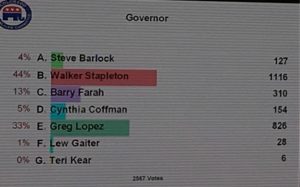 The two gubernatorial candidates coming out of the GOP Assembly in Boulder are Colorado State Treasurer Walker Stapleton (44%) and former Parker Mayor Greg Lopez (33%). Stapleton, we guessed, but Lopez was a bit of a surprise. The rest of the returns fell off a cliff: Barry Farah (13%), Attorney General Cynthia Coffman (5%), Steve Barlock (4%), Lew Gaiter (1%), and Teri Kear (0%). Make no mistake, this shift in strategy by Stapleton, giving him just four days to sway delegates the right way was a huge coup by Stapleton. If you asked us last weekend, we would have told you that Cynthia Coffman was the frontrunner for the GOP nomination for Governor. Then, Walker Stapleton tossed his petitions and made it on the ballot in the middle of last week. No doubt, Stapleton robbed Coffman of votes, but given that she only received 5%, did he really snag 25.1% of her votes? It’s hard to tell. Many who attended the Assembly thought she shot herself in the foot by smearing Stapleton, but the Assembly was not the appropriate way for Coffman to access the ballot. Petitioning on was her only viable route. Unfortunately, her fundraising was anemic and prevented her from mounting a serious petition drive. Of course, the real shocker today was how well Lopez did. We didn’t hear of him mounting a serious campaign in terms of delegate outreach or advertising. Was it his speech? Tell us – what was it about Lopez that secured your vote? Why isn’t Victor Mitchell listed? Victor Mitchell petitioned on the ballot. These are just the candidates who went through the Assembly.